Greeting card with movable doll. Nineteehth century. This fragile hand-painted card is an early example of a movable. 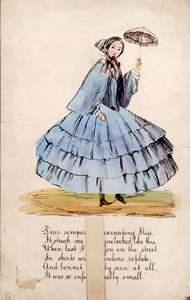 Its text addresses the little charming doll figure as "Dear simpering, fascinating Miss." She does indeed simper and fascinate as her billowing blue skirts move stiffly and she peeks out from under her tiny bonnet. 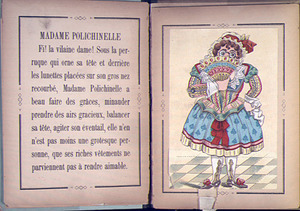 We see Madame Polichinelle dressed to the nines, and yet we are not deceived. Bright colors, rich materials, a fluttering fan, a wig, and glasses do not a lady make. 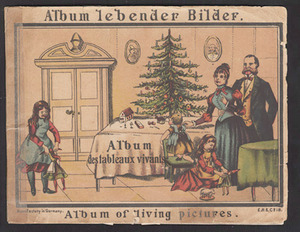 Album Lebender Bilder: Album des Tableaux Vivants: Album of Living Pictures. Germany: E. R. & Co., [1870s]. As is true of all these early books, the movable elements are simple and fragile. The "living pictures" in this work confine their mechanics to the back-and-forth motion of the seesaw and the rocking horse. Each scene strongly conveys and comments on a privileged nineteenth-century lifestyle in which the children are dressed elegantly, Christmas is bountiful, and Mother and Father watch over their family in loving embrace. 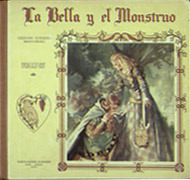 La Bella y el Monstruo. Barcelona: Manen, 1951. This Spanish tableau of "Beauty and the Beast" condenses the story to fit into two panels. The monster turns into a prince in a blink of the eye, and the happy ending appears almost before the story has started. Unlike the sentimental prettiness of German and English illustrations, the Spanish drawings are bolder and the colors more vivid. Oyler, Leslie M., et al. 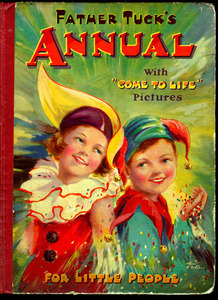 Father Tuck's Annual for Little People with "Come to Life" Pictures. London: Raphael Tuck, [between 1900 and 1930?]. 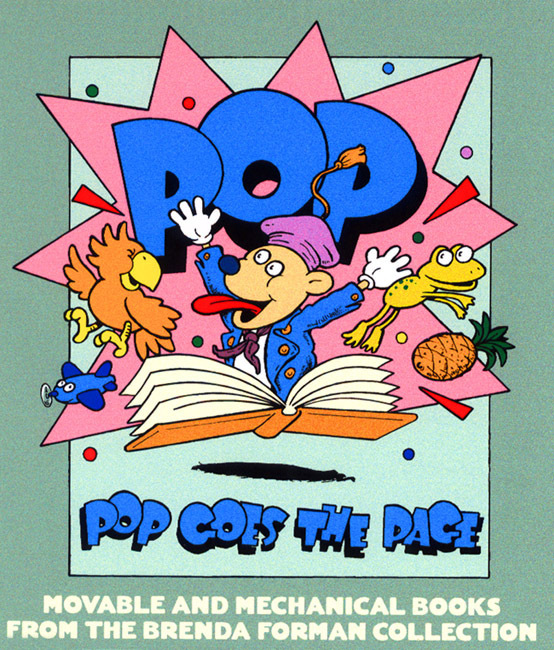 This book is the fourteenth annual published by Raphael Tuck. It combines a number of stories, poems, and illustrations with "come to life" pictures. Kubasta, Voitech. Robinson Crusoe. [Prague]: Artia; London: Bancroft, [1960s]. Voitech Kubasta brought the pop-up to new creative and physical heights. 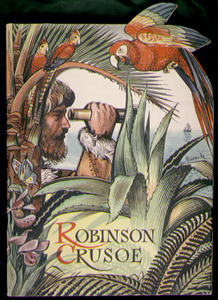 His vivid drawings enlivens Robinson Crusoe's tropical island and promises adventure and excitement in a colorful dramatic world.